This consultation, organised by the Universal Rights Group (URG), Amnesty International (AI), and the Jacob Blaustein Institute for Human Rights (JBI), and hosted by the British Ambassador to Uruguay, H.E. Mr Ian Duddy, will convene key stakeholders involved in the Special Procedures mandates on Chile, Guatemala and El Salvador, as well as the Working Group on enforced and involuntary disappearances, with a focus on Argentina, to share their unique experiences and personal insights on the impact and effectiveness of those mandates. Together, participants will reflect on the main challenges and opportunities faced, share success stories and best practices, and identify the determinants of the mandates’ influence and/or their failures. The testimonies, reflections and concrete recommendations emanating from this consultation will be published, along with further research and analysis, in a joint policy brief by URG, AI and JBI, to be launched and widely shared among delegates of the international community in Geneva, and beyond. 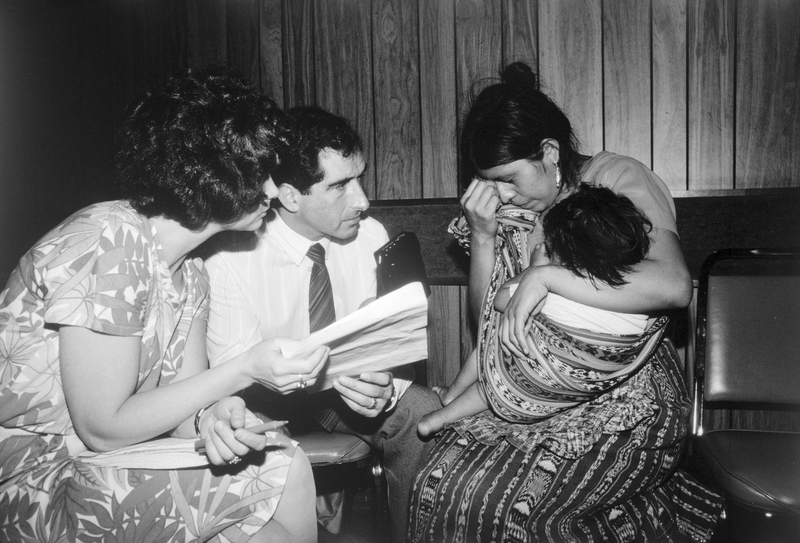 Amnesty International mission delegates (Tracy Ulveit Moe and Nigel Rodley) interview a woman re the disappearance of her husband, Hotel Camero Real, Guatemala, April 1985. To see the relevant documents by the Special Procedures and the Commission on Human Rights, please follow this link.